As consumers become more aware of the body’s circadian rhythms and how to tune into them for holistic benefits, beauty brands are creating products that align with natural planetary cycles. New launches in this category take inspiration from the phases of the moon. In Selling Cyclical Beauty, we explore the way modern consumers are actively acknowledging the importance of cyclical patterns and their effects on wellbeing. UK naturals brand Andrea Garland is tapping into this concept with its Lunar Face Oil Duo. Together, the curated blends aim to detoxify and strengthen the skin in alignment with the 28-day moon cycle. Launched in April 2019, both of the oils work throughout different phases of the lunar cycle. The Waning Moon Facial Oil purifies the skin when moving towards a new moon. The light-textured oil includes ingredients such as grapeseed, bitter orange and chia – all of which calm and soothe the desired area. Meanwhile, the thicker Waxing Moon Facial Oil restores and hydrates with olive squalane, jojoba, and sandalwood before the full moon. The facial oils are feeding into New Age beauty trends, in which lunar cycles play a growing part. Sixty-nine per cent of pivotals (aged 13-34) believe in a non-physical realm (BeautyCon Media, 2017) and the brand’s cyclical skincare concept appeals to this spiritually minded cohort. To keep track of this moon-motivated ritual, customers who buy the oils are provided with a lunar calendar for the year ahead. For more on how spirituality is being injected into beauty, see Make It Magic: New Age Beauty. Touting its sustainable ethos, as well as providing a planet-friendly option for eco-conscious consumers, Andrea Garland offers biodegradable refills to avoid using single-use plastic. This is a lucrative strategy to tap into: 72% of UK consumers would be interested in buying products made from recycled packaging (Mintel, 2018). For more on sustainable packaging solutions see, Packaging Innovations 2019 and Loop Zero-Waste Packaging Platform for Brands. 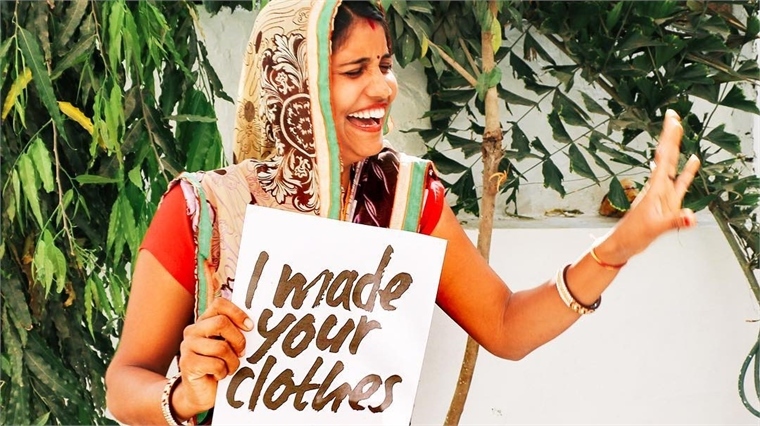 The global sustainability initiative Fashion Revolution will host its fifth annual week-long event from April 22-28. This year’s theme will focus on encouraging consumers to respect both people and planet via fair work policies, gender equality and environmental protection. We highlight the key events from the world’s biggest sustainable fashion showcase. Fashion Open Studios: As part of an ongoing initiative to educate consumers on production processes and promote transparency, countless designer studios will open their doors during Fashion Revolution Week. Highlights include a talk at Vivienne Westwood’s original store at 430 Kings Road in London, and an upcycling Mending Morning event at sustainable boutique Brigid McLaughlin in Sydney. Designer Phoebe English will also be hosting a Quilting From Waste workshop at her studio in South London. And in Berlin, Soup Archive offers visitors a space to experiment, create and repurpose their old items and factory garment leftovers. For a full list of events, see Fashion Open Studio. Swapping Societies: The Global Fashion Exchange will host a number of swap shops during the week, with events taking place in Amsterdam, Miami, Mumbai, Los Angeles and Bangkok. These day-long events invite customers to swap unwanted items, as well as attend panel discussions and workshops on industry sustainability. Discussing Change: In our Sustainability Round-Up: April 2019, we highlighted fashion’s relentless push for knowledge and education surrounding eco-conscious practices. Fashion Revolution Week will play host to a number of pioneering talks: an audience with activist designer Katherine Hamnett in London; and in collaboration with The Victoria & Albert Museum, Fashion Question Time will discuss how innovation and sustainability will change the fashion panorama. For a full list of the week’s events see Fashion Revolution. 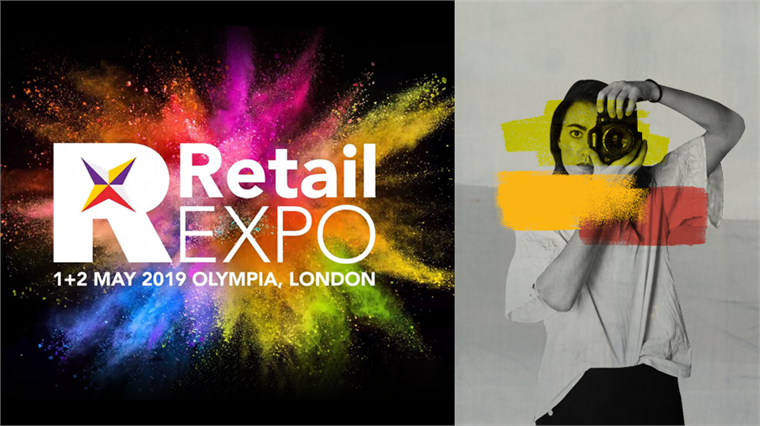 The annual Retail Expo returns to London next week (May 1-2, Olympia), delivering a holistic view of tomorrow's retail landscape. Featuring tech, design and digital signage zones, as well as speakers from retail, finance, hospitality, academia and beyond, it promises a wealth of innovation and strategic thought-leadership. We list our pick of the presentations. Myth-Busting Demographics: The event promises illuminating sessions on avoiding the pitfalls of preconceptions. Business expert and TV reporter Kate Hardcastle will confront consumer myths, revealing how to put Gen Z and millennials at the heart of your business. Meanwhile in Dynamic Youth, Stylus' own head of Retail, Katie Baron, will take a deep dive into Gen Z – explaining how they're sidestepping traditional media, swarming to side hustles and seeking support, along with the key opportunities for brands to unlock. Eco-Ethical Commerce: An increasingly sustainably minded public means a more responsible outlook is now a universal business imperative. Panellists Thomas Berry, director of sustainable business at luxury multi-brand fashion e-tailer Farfetch, H&M's sustainability manager Giorgina Waltier and Peter Andrews, head of sustainability policy at the British Retail Consortium, will be addressing climate change, emissions, waste and more. Garry Wells, lead store design buyer at British natural cosmetics brand Lush, will explore sustainability through creative store design. Look out for our upcoming Macro Trend Towards Our Sustainable Future, publishing on June 6 2019, for more on tackling this challenge. 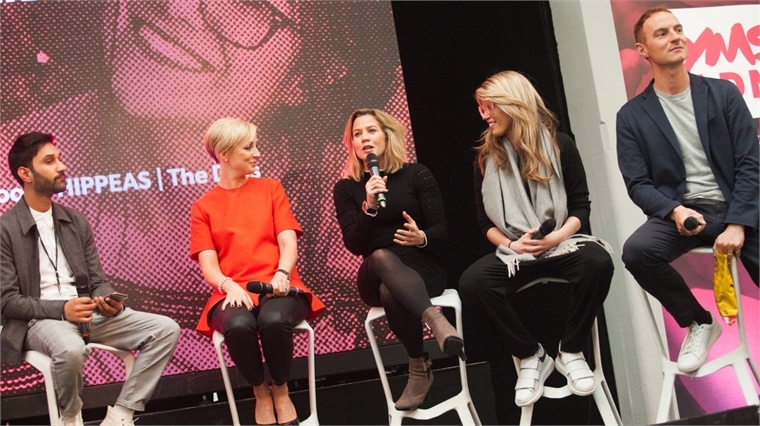 Experiential is the Answer: Recognising that experiential retail can forge valuable consumer connections, several speakers will focus on the booming appetite for bespoke brand experiences. Google's head of creative strategy, Amy Brown, will explore the cultural trends driving this growth, as well as her work on Google Curiosity Rooms (see The Brief for more). With sports stores proving to be an especially fertile ground for such experiential retail rides (see Retail's Spirit of Adventure), look to Adidas's HR director Julie Steinhoff. She'll be discussing the increasing importance of trial over or alongside transaction, and how other sectors can harness the passion of sport. Full coverage of the event publishes on May 9 2019. From innovating ‘good’ plastic to biometric data’s role in spatial design, discover Milan Design Week’s key trends from two festival regulars. Dewi Pinatih, our senior editor of Product Design, and Caroline Jacob, CMF design strategist at Seymourpowell, are veterans of the international design calendar’s leading event – and both join us as guests on the latest Future Thinking podcast. Could sensor technology – currently being developed in autonomous cars – be used in the home? How can your heart rate inform future retail and hospitality spaces? And is it time to stop demonising all plastic? 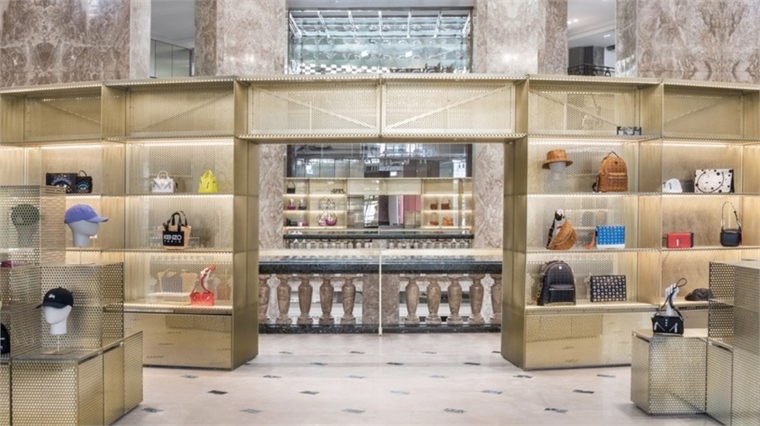 French luxury department store Galeries Lafayette’s new concept space on the famous Champs-Élysées rewrites the rules for multi-brand retailers. Gone are shop-in-shop concessions and street-level windows, instead, there’s a clandestine entrance tunnel, agent-style selling, trans-brand stylists and smart technology. In a strategic move to harness the pulling power of Parisian department stores (the only vertical in French retail that experienced growth in 2018), on March 28 Galeries Lafayette launched its ‘laboratoire de commerce’. Selling fashion, beauty, lifestyle and food from 650 brands, the space is firmly targeted to high-spending tourists. Altered Customer Flow: Designed by acclaimed Danish architects Big, the 6,500 sq m, four-storey Art Deco building (one-tenth of the brand’s Boulevard Hausmann flagship) subverts the traditional customer flow. Instead of a main entrance, a glass tunnel lures passers-by into an atrium enclosed by a ring of golden steel at the heart of the store. The store’s perceived disadvantages, such as no street-level windows, have been turned into key design features. Inside, six suspended glass boxes act as indoor shop windows. Experiential Focus: Besides three restaurants in the basement food court and a Provence-themed coffee shop designed by French fashion designer Jacquemus, the ground floor will host events including pop-ups, masterclasses and live music concerts. Agent Style Selling: Galeries Lafayette will only curate and sell products on behalf of brands without owning any inventory. Instead, it will take a commission per sale. Smart Tech Boosts Styling Conversations: Smart tech is key. Hangers with touchscreens provide inventory information and let customers order their size, while an app enables constant communication with stylists (who work across all brands, not just in concessions). Preferences, measurements, and purchasing history sit within a central dashboard accessible to the Galeries Lafayette team. 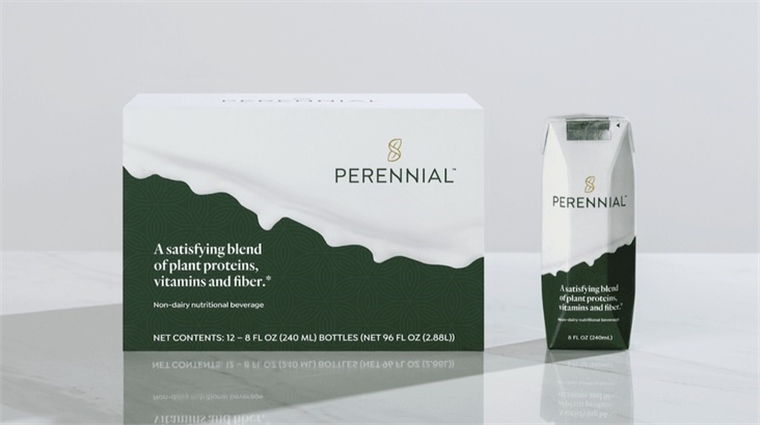 Looking to tap into the $15bn global spending power of the boomer generation, San Francisco start-up Perennial has launched a new plant-based beverage that offers an abundance of health benefits. The vegan, protein-rich drink is designed to ease the negative effects of ageing by boosting gut, bone and brain health. It includes prebiotic fibre to aid calcium absorption, amino acids for muscle health and algae to support brain function. The product contains no artificial flavours, colours, sweeteners, gluten or cholesterol. Despite boomers being the fastest-growing consumer demographic and responsible for 39% of all online purchases globally, just 1% of global innovation spend and 10% of marketing dollars go towards serving this age group (Perennial, 2019). Brent Taylor, co-founder of the brand, said: "[We developed this product because] there is a lot of frustration around the fact that this is a very forgotten demographic in food and beverage. We also just really want to create a better world for ourselves to age in." For more on how brands can cash in on this opportunity, read Boomers: Foods Goldmine Group, Retail For the Silver Economy and The Middle Aged Gap. See also The New Vegan Landscape for how to harness the plant-based diet opportunity. What would it look like if brands put people first? If marketers and advertisers prioritised function over content? “I would love British Airways to make it easier for me to book a last-minute flight to somewhere sunny; I would love a hotel company, on check-in, to give me a guide to bars in the area I might be interested in, based on my recent travel history. Listen to Tom – alongside our Media & Marketing team’s Christian Ward and Julia Errens – talk more about why advertising has become too aggressive, why some metrics are meaningless, and why it’s time to have more empathetic, imaginative, and gut-based discussions about what success looks like. At the Youth Marketing Strategy (YMS) conference in London (April 16-17), media experts, marketers and youth influencers will highlight the emerging opportunities for brands as the market adapts to the next generation of consumers. Gen Z are anxious to secure their future in what they believe is an unstable world. From consuming educational podcasts to setting up shop on mobile fashion resale platform Depop, this cohort is making full use of its status as digital natives to activate every opportunity for personal and economic growth. By next year, the cohort will represent 40% of all consumers. US Gen Zers already command a spending power of $143bn (Barkley, 2018). It is key that brands keep up with the pace of change that is being set by Gen Z's expectations and habits. For instance, 63% of Gen Z are active in at least one loyalty programme, and 36% are most interested in gaming as a means to earn brand loyalty rewards (CrowdTwist, 2018). 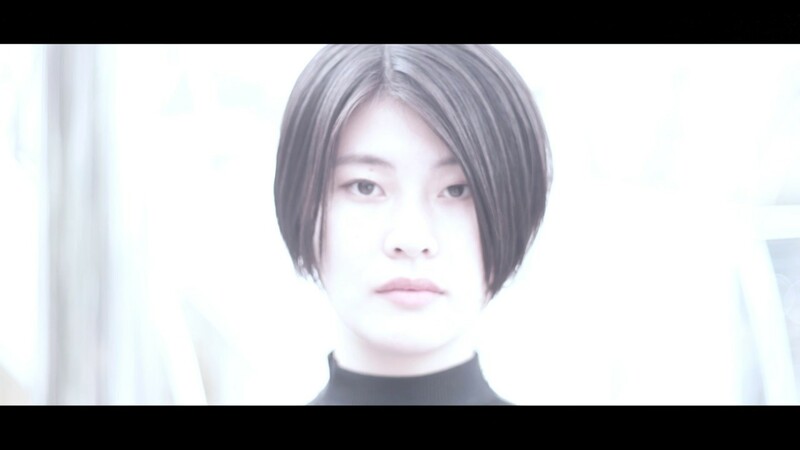 Our Spotlight Trend Dynamic Youth explores these digitally driven attitude shifts in depth. Katie Baron, Stylus' head of Retail, will take the stage at YMS's retail stream to present a keynote on our findings. Attendees will also hear insights from brands like Levi's, Nike, Instagram and 20th Century Fox. For more on Gen Z's cultural drivers, check out The State of Esports, Pop Culture Close-Up: Meme Mechanics and 10 Youth Trends to Watch. After Lush debuted a tech-powered packaging concept at its pop-up in Milan, the brand plans to implement this digitally led, eco-conscious approach around the world. Will this new retail strategy influence brands to reduce their in-store packaging? 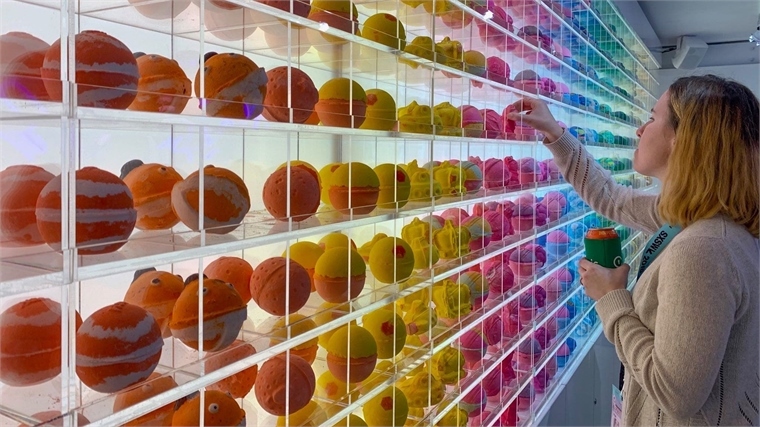 British naturals brand Lush exhibited its digital concept shop with packaging-free products at this year’s SXSW 2019. It was their first-ever appearance at the Austin-based show, and it gave Lush an opportunity to highlight their pledge to develop and incorporate technology into waste reduction initiatives. The pop-up showcased 54 new bath bombs without labels or packaging. Instead, the Lush Labs app uses artificial intelligence and machine learning to reveal product details. By scanning the bath bomb, customers can find out the name, ingredients and price of a product. It also shows how bath bombs will look once submerged in water, which, the brand claims, will help save water resources by removing the need for in-store demonstrations. In the US, 67% of millennials now research online first and buy in store later (AdAge, 2018). Lush aims to appeal to this cohort by giving customers access to online reviews when they scan products using the app in stores. This feature forms part of the brand's long-term strategy to blend the online and offline shopping experience seamlessly. For more on this approach see, Omni-Commerce Gets Personal. To read how other brands are diversifying digital packaging strategies to support customers in meaningful ways, see Packaging Innovations 2019. Also, keep an eye out for our latest Spotlight Trend Packaging Futures 19/20: Catering to Convenience publishing on April 30. A mix of digital and physical activations, exclusive content drops, and quirky collaborations has powered the supersonic rise of 17-year-old American singer Billie Eilish. Eilish sits atop the US charts this week with her album When We All Fall Asleep, Where Do We Go?. Without a breakout radio hit to bring her to mainstream attention, Eilish and record company Interscope focused on partnerships with key platforms and social channels to reach the right audiences. Interscope teamed up with Spotify for a real life, multisensory experience in downtown Los Angeles in April 2019. Interactive rooms were set up to represent each one of the album's 14 tracks: one was occupied by puppies and another recreated Eilish's bedroom. Open to the public for three days, it offered an "immersive journey through Billie's mind", said Spotify. The activation taps into multisensory marketing trends that we explore in more detail in The Sensory Opportunity. Alongside this partnership, Eilish also collaborated with retail social platform NTWRK to release limited edition merchandise during the Spotify activation. As music competes for attention across a number of streaming platforms, this sort of retailtainment marketing is vital for music artists. Interscope offered different types of exclusive Eilish content to Spotify, YouTube, Amazon and Apple Music to engage in a way unique to each service. Amazon worked with Eilish on behind-the-scenes video clips, while YouTube partnered with her on a series of short documentaries – the first episode has attracted over 3.5 million views since launching in February 2019. For more on the crossover between entertainment, retail, social and marketing, see Retail Meets Marketing, part of our new Dynamic Youth Spotlight. As we explore in A Sustainable Journey, technology is driving solutions for a more eco-conscious fashion industry. Harnessing this mindset, Japanese research collective Synflux has developed Algorithmic Couture (AC): a digital design system that minimises waste by creating garments that fit perfectly. In February 2019, Algorithmic Couture debuted at creative festival Design Indaba in South Africa. Created in collaboration with fashion designer Kazuya Kawasaki, designer Kotaro Sano, and engineers Kye Shimizu and Yusuke Fujihira, AC’s aim is to disrupt the entire system of production. "The existing linear model created on the premise of mass production and consumption desperately calls for a change," said the creators. "Looking to a more sustainable future, we must reconsider the holistic cycle of fashion." According to Synflux, 15% of fabric is wasted when making clothing that follows the current system of sizing. There is also a distinct lack of options for those that do not fit the specific measurements of traditional sizes. To combat these issues, AC utilises 3D body scanning to determine an individual’s exact proportions. This data is then used with machine learning algorithms to create an optimum garment pattern that reduces fabric waste to zero. Now, the team are looking to work with major fashion brands to further develop their technology. With AC appealing to customers seeking size satisfaction, as well as their burgeoning eco-conscious mentality, brands should explore the potential of digitised design. For more on fashion’s emerging eco-consciousness, look out for our Sustainability Round-Up, publishing on April 11. Our latest Spotlight Trend, Dynamic Youth, gets under the skin of today’s teenagers. Here’s what you’ll discover in its three reports. So, who are the Dynamic Youth? Gen Z. You’ve probably heard of them. Aged around seven to 23, they’re distinctly different to the generations preceding them. In fact, the way they think, communicate and consume has been entirely reshaped. Well, this is the first generation of digital natives. They’ve grown up (or are still growing) in an era of technological change, social media dominance and a volatile economic climate. They are, as a result, agile, driven and focused on equality. Presumably this has implications for brands? It does. Big ones. The Dynamic Youth – by which we really mean teenagers rather than older or young Gen Zers – are also pragmatic, risk-averse and seeking support in many areas of their lives. And it’s key to understand them now, because by 2020 they’ll represent 40% of all consumers. How can I start understanding them? Well, consider the Dynamic Youth from three angles. First: the phenomenon that is the Gen Z side hustle. In Powering the Brand of Self, we unpack how brands can infiltrate and assist this space by exploring everything from personalised micro shops to monetised mentorship. Second: you’ll need to play to Gen Z behaviours. In Retail Meets Media, we highlight the importance of your brand showing a point of view, how you can embrace hyper-interactivity, and how to appeal to Gen Z’s desire for focus and continuity amid the social-media chaos. Third: know that, for an open-minded Gen Z, inclusivity, ethics and the expectation of connections are default settings. Know also that the isolation of digital living, coupled with economic uncertainty, have triggered a collective crisis of confidence. In Making Scenes: Purpose, Protection & Connection, we uncover a new commercial breed of self-care services, and, intriguingly, in-real-life concepts that counter social-media-induced malaise. What else will Dynamic Youth teach me? That today’s teenagers really want to make something of themselves; they don’t want to feel like they’re selling out. That they’ll engage with well-constructed content; hype and authenticity aren’t everything if a video, for example, is well-considered. And why helping the undeserved, and taking a beyond-transaction stance, will be key strategies for future teen favourites. The mounting emphasis on sustainability sees waste being reintroduced into new product. However, for this eco-friendly focus to ring true, recycled materials must gain a sense of value in order to avoid being thrown away again. 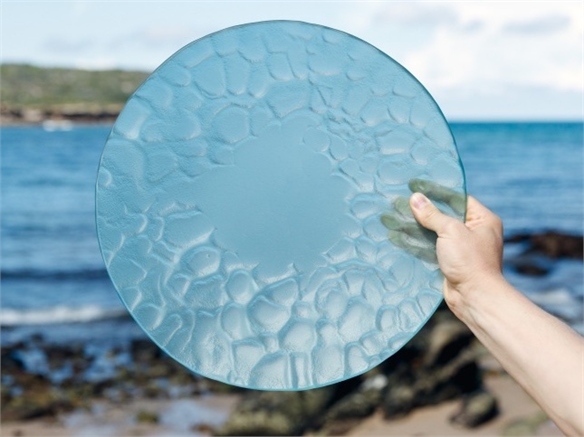 Kim Stanek achieves this by drawing inspiration from his Sydney surroundings to transform waste glass into covetable tableware. 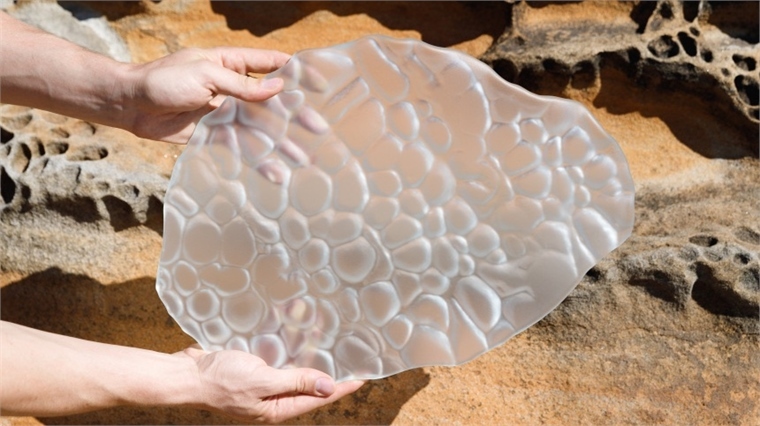 The Australian designer’s collection, Celebration of Sand, is inspired by the pitted rock found along the country’s eroding sandstone coastline. To create an organic form, Stanek collected sand from a nearby beach to cast a mould that bears the realistic, dappled look of rock worn down by seawater. 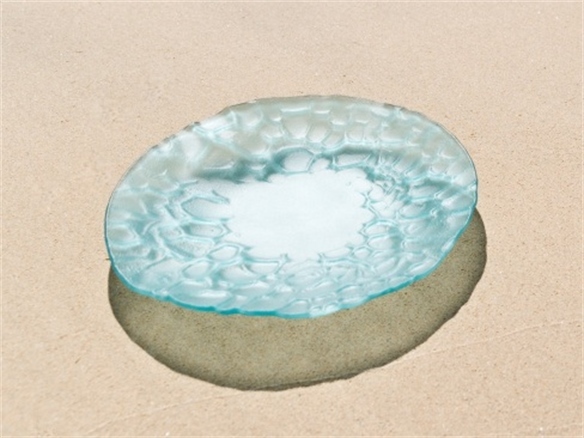 Discarded glass is reheated over this mould to take on its shape before being sandblasted to achieve a soft-touch surface that mimics the look of gradual wear. The project explores the role of sentimentality in forging sustainable relationships with product. As we explore in our Macro Trend report Crafting Modern Connections, consumers are using products to connect to their personal history and family roots. By referencing a motif that derives from a local environment, the collection gains emotional value by communicating the experience of a targeted group of people. This emotive approach to design is particularly relevant to products that incorporate recycled materials, as it drives the desirability of waste and promotes better ownership by rebranding goods as keepsakes to be cherished and passed on. For more on how crafted details are breathing new life into waste, see our S/S 20 Design Direction Journey. 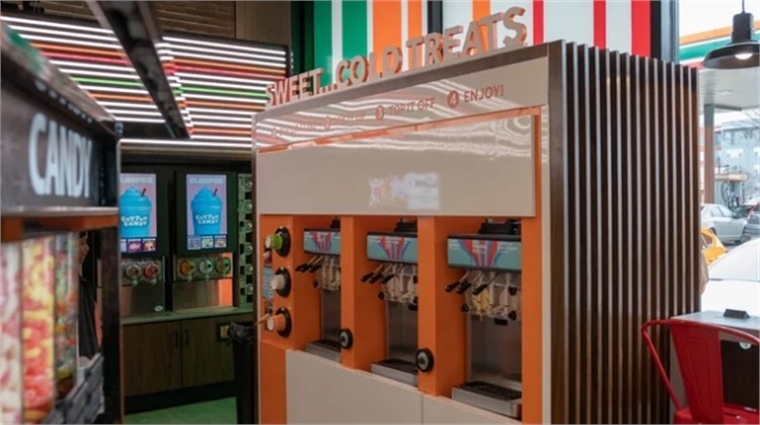 Blurring the boundaries between retail and hospitality, US convenience store 7-Eleven has opened a sit-down restaurant in Dallas, Texas. The new space will road test new products and services. The hip outpost offers made-to-order coffee (including nitro cold brew), tea, kombucha, cold-pressed juices and pastries, alongside a self-service craft beer station. It also features a frozen yogurt and ice cream bar as well as a taco stand. Chris Tanco, 7-Eleven's vice president and chief operating officer, said of the opening: "This new lab store will serve as a place to test, learn, and iterate on new platforms and products simultaneously to see what really resonates with customers and how we can take those learnings system-wide." The retail chain is set to open two more stores in San Diego and Washington D.C. this year. This move by the convenience retailer is a savvy one: it capitalises on the opportunity for boosted sales thanks to increased dwell time; and it enables the brand to experiment with new and innovative products on a manageable scale, before rolling them out across its 66,500 stores in the US. For an earlier successful example of this sort of symbiotic thinking, see Japanese lifestyle brand Muji's hotel concepts in Shenzhen, Beijing and Ginza, covered here. Read also Retail's Elastic Brands: Stretch & Diversify and Brand Stretch: Elastic Food & Drink Development. Targeting Gen Zers with creative aspirations, Nike is celebrating its famous Air Max shoe with sneaker design bootcamps in 12 global cities from March 21 to April 21. Playing on strategies in our just launched Dynamic Youth Spotlight (see Powering the Brand of Self), its state-of-the-art consumer-creator labs offer insights from Nike’s in-house team, as well as the chance to get hands-on. Dubbed The City Department, the free one-day courses provide an introduction to sneaker design and production, exploring industrial design, illustration and typography, plus colour and materials. Classes are hosted by Nike designers, collaborators and creatives including material experts, industrial designers and graphic artists from the respective cities. 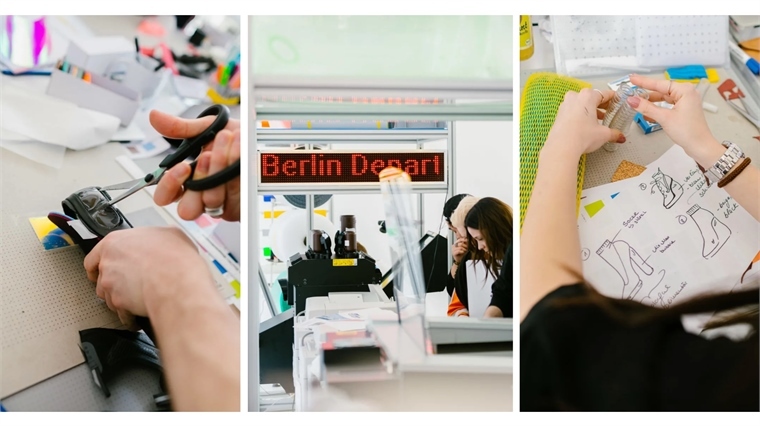 At the Berlin course (March 23-26), Nike’s senior design director Devon McKinney talked about the different design stages: from research and conceptualisation to prototyping and presentation. Meanwhile, Errolson Hugh, co-founder of German functional fashion brand Acronym (and a frequent Nike collaborator), extolled the need to consider the impact designers’ use of technology has on wider culture. Participants were encouraged to bring their own visual references, inspirations and perspectives to the table. Then, they created their own sneakers in a space equipped with individual workstations, materials and tools, including 3D printers. An entire team of Nike designers were on hand for additional support. At the end of the day, they presented their creations to Nike’s senior designers. To get involved fans registered online, and all of the classes were fully booked within hours. Other courses will take place in LA, NYC, Toronto, Paris, Mexico City, Moscow, Bangkok, London, Chicago, Tokyo and Seoul. While classes are registration only, the spaces feature photo-ops, a donation centre for old sneakers, a mini-store selling the 2019 Nike Air Max 720, and an exhibition showcasing visuals about Air Max’s rich history.